David Wright finished Survivor: Millennials vs. Gen X in fourth place during Wednesday night's two-hour finale broadcast on CBS. 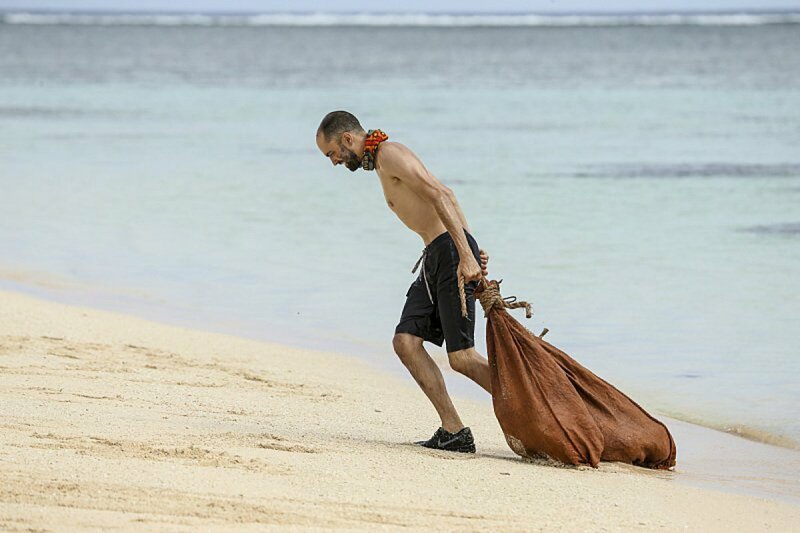 David, a 42-year-old television writer from Sherman Oaks, CA, was voted out of the Vinaka tribe before the Final 3 because nobody thought he or she could beat him in the end. David had an amazing transformation on the show, going from a guy who was scared of everything -- the sun, loud noises, bugs, and the list goes on -- to a man who could win Individual Immunity Challenges, strategize his way out of tough situations and make sincere friends. Season 33's Final 3 castaways were Adam Klein, Ken McNickle and Hannah Shapiro. Adam ended up winning the game with a unanimous 10-person jury vote. In an exclusive interview with Reality TV World on Thursday, David talked about his Survivor experience. Below is the first half. Check back with us soon for more. Reality TV World: When you made your fake idol, did you ever consider convincing people that you had found a real idol? My assumption is given the way the season played out, if people found an idol, it'd make them more of a vote target rather than less of one. Was that your reasoning? David Wright: Really, my reasoning was that, you know, you can make a fake idol look only so authentic. So, if you make it yourself and then show somebody, "Look, I've got an idol," I think they're going to doubt it a little more than if they were to stumble upon it themselves and come to the conclusion that it's an idol. So that was really my thinking there. And I just thought it would be fun. Reality TV World: What did you realistically think the chances were your fake idol plan was going to work? What would you have done if someone other than Justin "Jay" Starrett had found it? Was there anyone else you were trying to also trick? David Wright: Jay is the one I wanted to find it, but yeah, I was worried that Ken or Hannah would find it and then it would just be completely pointless, because at that point anyway, they were already working with me. So, it wouldn't have done anything. I mean, I could've hid it back in the game, but Jay was the one I wanted to find it. Reality TV World: So you probably would've just revealed to anyone but Jay it was a fake idol? David Wright: Yeah, naturally had Hannah found it, she would've known it was fake because I had broached the topic with her earlier. Reality TV World: Did you believe Jay would honor his promise to take Adam and yourself to the Final 3 once you were enjoying that steak reward? David Wright: Yeah, I really did consider it. I felt like he was being sincere; I felt like he really did [mean it]. I think that was his best move and that would save his game. And in hindsight, I totally should've done it. I totally should've gone along with him. So that's one of my regrets from the game. We talked, Jay and I, after the game, and we thought that possibly it would've been a tie at Final 3 with us with the jury and we would've gotten a chance to see what happens -- how they deal with a tie-breaker situation at Final Tribal. But unfortunately, it wasn't meant to be. Reality TV World: You thought you were the biggest target once Jay was voted off and would be going home next, but Hannah opted to vote against Bret LaBelle, sending him home instead. How big of a surprise was that to you? Did you think that was a wise strategic move for Hannah to make or a bad one, like Adam was insisting? David Wright: I mean, I believe that was not Hannah's best move, and I was as shocked as anyone when the votes were read and Bret went home. And then, you know, suddenly I was feeling really good about my chances to get to the Final 3. I was like, "Why are these people letting me get this far?!" But yeah, Hannah played the game she played and I think she played a great game, but that move in particular was not a good move. Reality TV World: You made a speech at the Tribal you went home about how you had a Final 3 deal with Ken from the start of the game and Ken brought a depth of trust, honor, loyalty and integrity like no other Survivor ever. You said those things are extinct in this game and you didn't trust anyone more than him -- all reasons why you claimed not to be worried about a vote-off. Did you really believe that or were you trying to put Ken on a guilt trip so he'd stay true to his word? David Wright: Well, Ken was the only person I trusted 100% in the game, and then walking into Tribal, I actually did believe that he was going to protect me and save me, but about a minute deep into the conversation at Tribal, I realized, "Oh no, that's not what's going to happen. I'm going to go home." So, I then thought I had to appeal hard to those things he values, like trust and loyalty, and so that's what that particular speech was about. I was pretty sure I was going home, so I thought, "This is the only move I've got right now." And unfortunately, it wasn't enough. Because Ken, you know, he made the right move for himself and his daughter, so I don't fault him for it. Check back with Reality TV World soon for the concluding portion of our exclusive interview with David Wright.